Going Out to Buy Wine? Don’t Forget Your Empties. I sometimes joke that Australians are more American than Americans. I don’t mean they can be a bit loud (which they can) or aggressive (think of a boxing kangaroo), but that, in general, Aussies are not particularly respectful of tradition or formality. Which means that when it comes to wine, Aussies don't take themselves too seriously (to be admired in the sometimes-stuffy wine trade). Another byproduct of this cultural perspective is innovation. In the world of wine, Australia is not an especially large producer nation (peers by volume include Argentina, South Africa, Germany, and China) but its development of winemaking technology has had an outsized impact on the industry worldwide. Since Australians are so often forward-looking, it’s also a great place to find a wine surprise. Australians. Not known for their sense of reverence. But pretty good at stating the obvious. The Queen Victoria Market in Melbourne is a magnet for tourists and locals alike. I set out for a morning walk about on a recent visit to Melbourne, grabbed a latte (Aussies are also serious about coffee), and roamed the many aisles of trinkets, crafts, and produce. From a distance, I noticed what looked liked several wine barrels. Curious, I went to investigate. The barrels were neither furniture nor art. Instead, I had stumbled upon ReWine, a purveyor of quality Aussie wine with a unique customer experience angle–buy a bottle of wine, enjoy it at home, bring the bottle back, and get another wine at a discount. The packaging is simple, the overhead costs are minimal, and customers get great wine at a solid value. 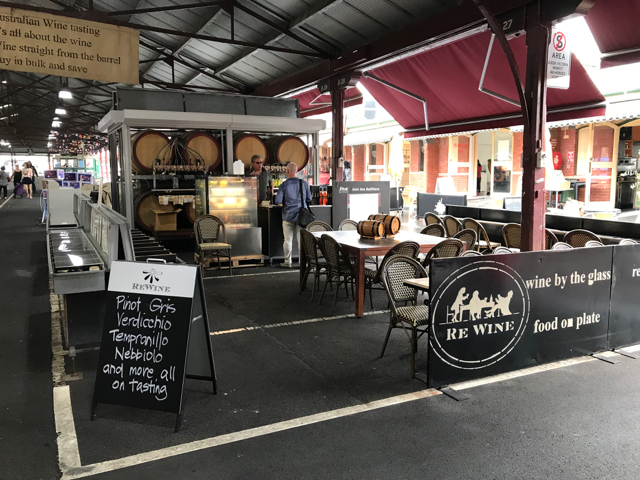 ReWine is located in the Queen Victoria Market in Melbourne. There’s also the environmental benefit, of course. Some customers have reportedly used the same bottle for hundreds of refills (recycling glass requires a significant amount of energy, of course). It isn’t just the customers and the planet that do well in the ReWine arrangement, the wineries that partner with ReWine receive their own reward–cash flow. Winemaking is an extremely capital-intensive endeavor. Vineyard land is expensive, new vines require a few years growth before producing quality grapes, equipment and facilities are costly, and the final product is aged intentionally (sometimes for quite a long time) before it can be sold. When ReWine buys a large quantity of wine in bulk all at once, that helps the wineries keep producing. Négotiants like ReWine find great wine and bring it to the public. Refilling bottles on site from 16 different barrels of wine. The large network of winery partners at ReWine results in a tremendous amount of variety on offer. From Tempranillo to Tawny, I counted more than 20 kinds of wine in the market stall. (With 16 barrels on site, a few wines are not available for refill.) All wines can be tasted before purchase so customers know what they’re taking home. 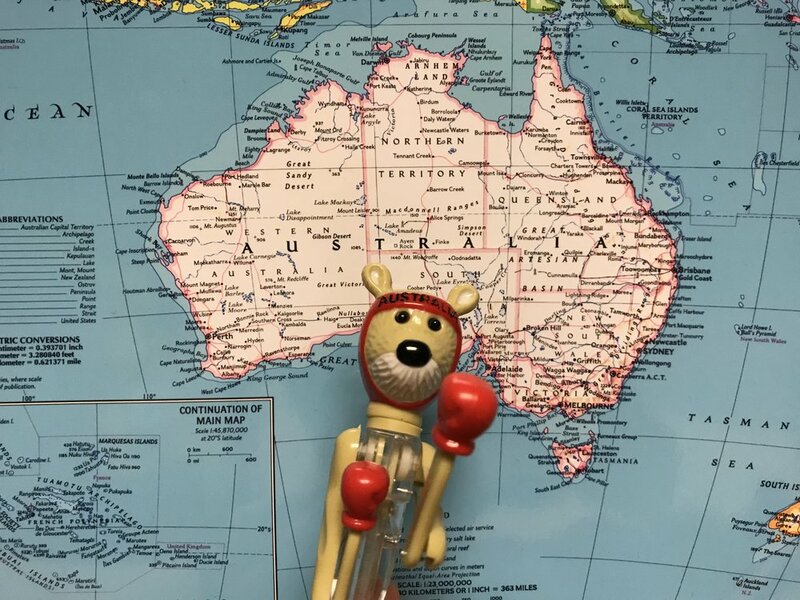 While there are certain technical challenges to this approach to fulfillment, ReWine seems to have conquered them all in true Aussie style. I wouldn’t recommend ageing these wines long-term at home, but I don’t see any risk of them going off before you’ll want to drink them either. So many choices... Sparkling Moscato, Gewürztraminer, Viognier, and more. The price is reduced by $3 if you bring back your bottle to refill. Europeans from older generations may recognize this “revolutionary” approach as the way wine was sold in their villages years ago. Sure enough, old things become new again. For city dwellers, however, driving out to a winery (or several) for wine refills these days would not be nearly as convenient as hopping in the family Citroën (or jumping on the family Vespa) for the short trip to the winery down at the end of the country lane back in the good old days. So ReWine has you covered. At least if you live in Melbourne. We don't offer our wines in refillable containers (yet) but we do love a good wine surprise. Have one to share? Email us!